Do you have an idea of something we should feature on the blog? Contact us here! As I mentioned earlier today, one of my favorite things about Christmas is the lights! Cities and communities all over the world are decorating their towns with holiday decorations and are kicking off the season with a tree lighting ceremony. In many places, you can expect a variety of fun festivities in addition to a grand evergreen, such as Christmas carols or live reindeer. Grab your hats and mittens and take your family to a tree lighting near you! 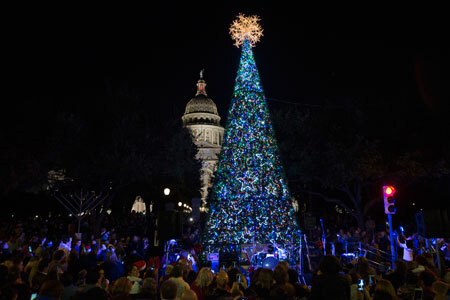 Make your plans to head into downtown Austin this Saturday, December 3rd, to participate in the Holiday Stroll. You’ll want to get there early because there’s much fun to be had! Shop the farmer’s market for holiday gifts at 5pm, then lift your voice and join the holiday sing-a-long at 6pm. Just as you’re getting warmed up, you can see the tree light up at 7! The tree in Historic Dublin will be lit tonight! Brace yourself for an enjoyable evening, as kids can see live reindeer and visit with Santa, plus adults will enjoy watching artisans carve an ice sculpture. If that wasn’t enough to entice you, perhaps the free hot chocolate will—yum! On Friday, December 2nd (tomorrow!) the jolly folks in Geneva, IL are putting on a spectacular holiday celebration. Santa Lucia’s arrival kicks off the festivities at 6pm, followed by Santa Claus himself who will light the tree. Stick around and roast some chestnuts, enjoy music from strolling carolers, or go for a carriage ride with your sweetie. 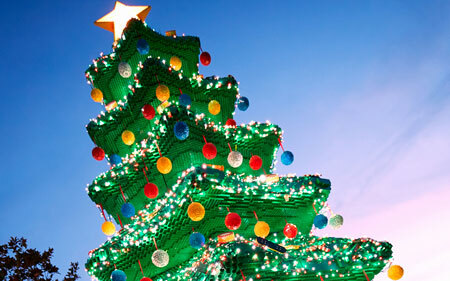 LEGO™ lovers in California will want to visit the LEGOLAND resort to see the giant Christmas tree made from thousands and thousands of bricks! Positioned near the entrance to the park, stop by to see this big tree come to life with twinkling lights every day from now until Christmas Day. For those of you in the the metro Tucson area, hop in the car and take a short drive over to Marana for their tree lighting ceremony on Saturday, December 3rd. Fun for the whole family, the celebration starts at 3pm with performances by a youth choir, dance troupe, and more. Then at 6:30pm, the much anticipated Christmas light show will begin! For 21 years, the folks in Mt. Pleasant, SC have been celebrating Christmas with an annual holiday parade. 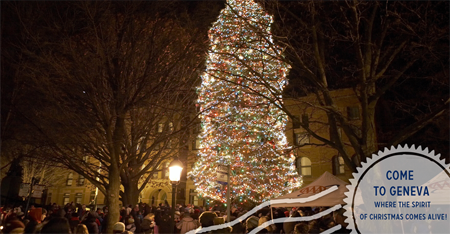 This year the festivities begin on December 11th at 5:30pm when the town’s Christmas tree will be lit. The tree lighting will be followed by a display of fireworks, and then the holiday parade will proceed through the streets. Want to find a good spectator spot? Click here to find out where exactly the parade will travel. Roasted chestnuts, hot cocoa, and Christmas carols are just some of the fun things you’ll enjoy at this tree lighting ceremony. 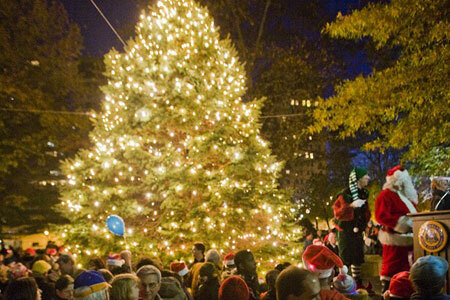 Rittenhouse Square is home to Philadelphia’s largest Christmas tree, so when the 5,000+ lights start glowing, it’s truly a sight to behold. Clear your schedule, because these festivities are tonight, December 1st! 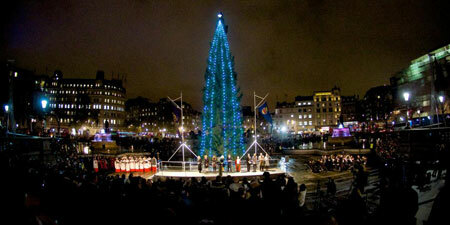 In keeping with tradition, the grand evergreen in Trafalgar Square hails from Norway. Tonight, the Christmas tree will be lit at 6pm by a few folks, including the Norwegian Ambassador. If you miss this evenings’s festivities, you can mark your calendar for the Blessing of the Crib on December 4th or Carol Singing on the Square throughout the month. If you love all of the handcrafted goodies on Etsy as much as I do, then surely you will also have fun at one of these indie Christmas craft fairs, which are essentially Etsy in event form. At these markets you will find a wide variety of wares—clothing, jewelry, baked goods, ceramics, cards, and loads more. By shopping at one of these fairs, not only will you be able to find truly unique Christmas presents for your loved ones, you will also be supporting local small businesses, so it’s a win-win. Below I’ve highlighted a few of these merry markets, but if you have a favourite local indie craft fair in your area, let me know in the comments! Frustrated with the lack of indie craft fairs in Philly, Rachel from The Crafted Life decide to host her own! 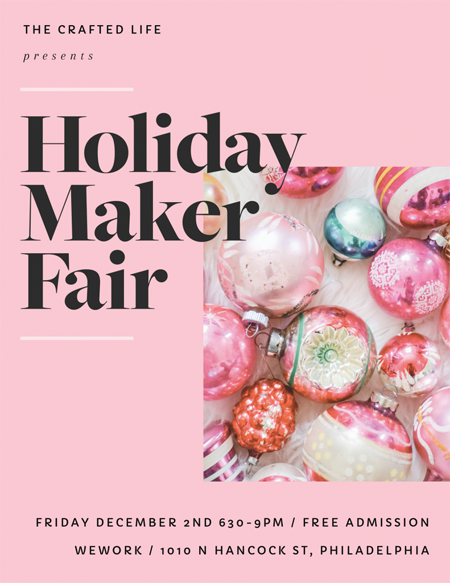 During First Friday, head on over to the Holiday Maker Fair and browse the goodies from a curated selection of local crafters—some of whom even make neato Philadelphia-themed items. While shopping you can also enjoy refreshments or pop into the holiday photo booth. 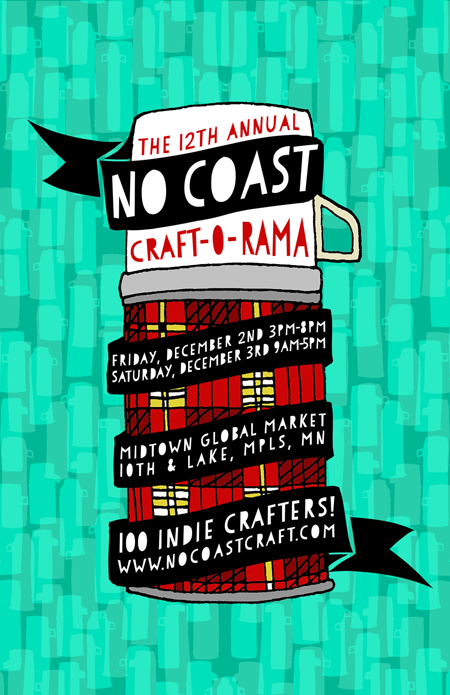 If you’re in the Twin Cities area, be sure to check out the 12th annual Holiday No Coast Craft-o-Rama. This indie, urban, and modern art & craft show will feature woodworking, ceramics, cards, handcrafted dog toys & treats, and more. And as a twist on the traditional tote bag giveaway, each vendor will be giving away a free No Coast tote with the first sale of the day on both days—no matter how big or small the purchase is. 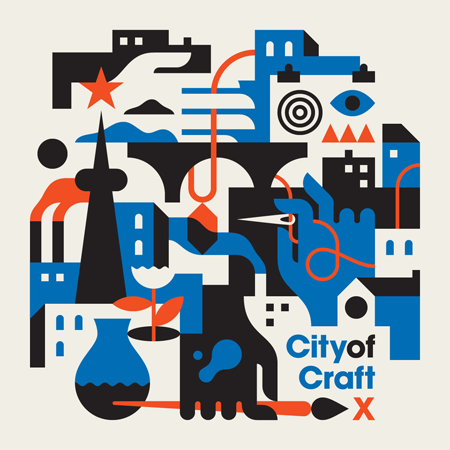 This holiday season you’re invited to a crafty birthday party, as City of Craft turns 10! To celebrate this past decade, they’re hosting a weekend-long party with more than 60 of T-Dot’s best makers, workshops, installations, and giveaways. Whether you go on Friday night for drinks & music or show up bright & early on Saturday morning for one of the limited edition swag bags, you’re sure to have a great time. 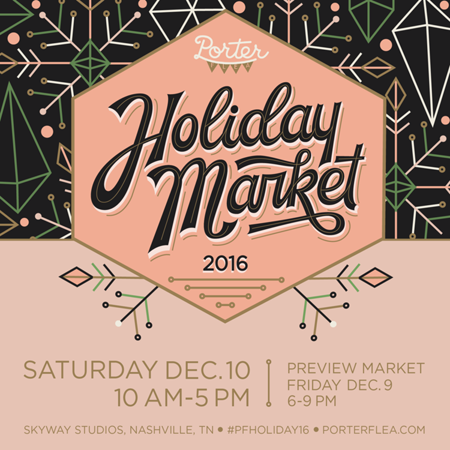 Named Best Artisan Market by the Nashville Scene in 2012, Porter Flea Holiday Market is a juried and curated market that focuses on unique, local, and handmade gifts. Here you will find a variety of goods, including children’s toys, enamel pins, home decor, clothing, and holiday cards. You have two options on how to attend: the more intimate, ticketed Preview Market on Friday evening or the free Main Market on Saturday. 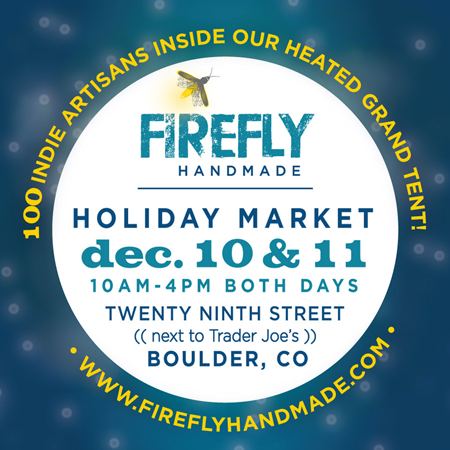 Join Firefly Handmade for their first ever outdoor holiday market inside a giant heated tent at the popular Twenty Ninth Street shopping district. This event will feature indie wares from 100 vendors, such as bohemian inspired jewelry, coffee scrubs, paper goods, and craft wines. If that wasn’t enough, there will also be artisan demos, food trucks, live music, AND a vintage VW bus photo booth. While I would love to feature all of the indie Christmas craft markets, I have to get back to my other elfy duties. But, since I really just can’t help myself, after the jump you’ll find info on just a few more craft fairs happening this month. Last November, the outdoor recreation and sporting goods retailer REI did something rather unheard of. On Black Friday, they closed all of their stores and paid their 12,000 employees to spend time outside. They dubbed this campaign #OptOutside, and they encouraged everyone else to join them in the great outdoors instead of at the shopping mall. What a refreshing idea! 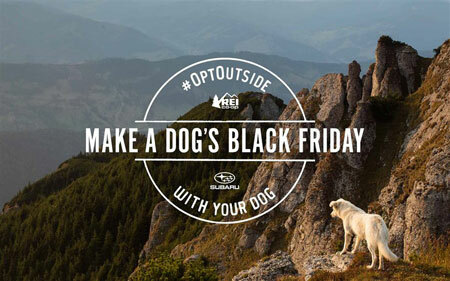 This year I’m thrilled to report that REI has partnered with Subaru, and together they are inviting dog lovers to #OptOutside with their pups this Friday. I simply cannot think of a better way to spend a day than being outside enjoying nature with my best friend—my basset hound—so I’m all for this. If you need help deciding what to do with your pup, check out REI’s list of dog-friendly activities. To make this campaign even better, if you post a photo of you and your doggie out in nature with the hashtags #OptOutside and #MakeADogsDay, Subaru will make a donation to the ASPCA. True to their motto—“We are their voice”—the ASPCA strives to make lives better for animals in a variety of ways. They work with the government to enact and enforce animal protection laws, perform spay/neuter operations across the country, run an adoption centre in NYC, transport animals to shelters, save animals from horrible conditions, and much, much more. Working to protect those who have no voice is a noble mission indeed. I truly hope that everyone will venture outdoors with their dogs this Friday to pause and enjoy the beauty of nature. If you do, don’t forget to post a photo on Instagram, Twitter, or Facebook using the #OptOutside and #MakeADogsDay hashtags to help raise money for the ASPCA! 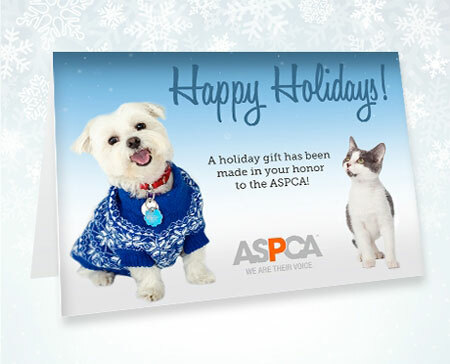 Additionally, if you want to give more to the animals, you can always donate to the ASPCA in honour of a loved one or host a Holiday Campaign. If you love the movie, How The Grinch Stole Christmas, then I’m sure you’ll be as excited as I was to learn about this musical production! Max the dog, Cindy Lou Who, and the green man himself will be on stage delivering a heartwarming performance the whole family will enjoy. To catch a show near you, take a peek at the list below. And, if you live near Nashville, TN, you’re in luck because the musical will be performing at Opryland all season long! For tickets and information, click here. Want to have breakfast with the Grinch? Get the details here. Can’t attend a local show, but want to experience the magic of the musical? 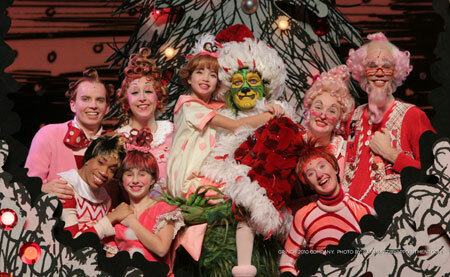 Get the Dr. Seuss’ How the Grinch Stole Christmas! The Musical soundtrack on iTunes or Amazon. The holiday season is always so fun, but it can also be stressful, especially if you are travelling. Well, I have some good news… If you live in the USA and are flying today, you may come across some furry friends at the airport! United Paws—a program from United Airlines designed to delight customers—will once again be bringing professionally trained comfort dogs to airports. United added more airports to the list this year, and doggies will be at Chicago-O’Hare, Cleveland, Denver, Houston, Los Angeles, Newark, and Washington-Dulles. Puppies at the airport!? That would certainly delight this airline customer! So if you are flying out of or have a layover in ORD, CLE, DEN, IAH, LAX, EWR, or IAD today, de-stress before take-off by petting a four-legged pal. Maybe you’ll even get a smooch from a sweet pup! The Elf Blog is proudly powered by WordPress, milk & cookies.